I love cats and eslprintables. 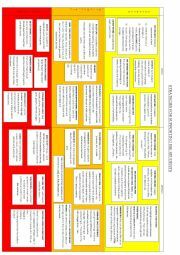 Here is a compilation of fun activities and games, 47 activities over 4 pages, all tried and tested, requiring little or no preparation. I hope you will find it useful. The box template is Zailda´s. 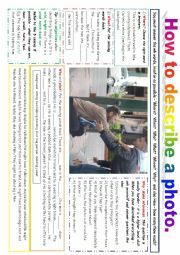 Here are guidelines for describing a picture and I´ve made them into exercises. I just love this photo. Two pages, present continuous focus. The picture is from Babylon Puzzles and I have permission to use it. Hope you will find it useful! On the first page, some exercises for past simple. On the second, a suggestion for how to introduce this tense. I have used this picture before, with the present continuous. 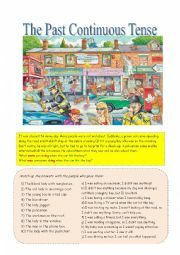 The past continuous tense with a busy street scene. Two pages, with a match up, true or false, questions and key. The policeman asks, ´What were you doing when the accident happened?´ Thanks to Ravensburger for letting me use this picture, which I´ve used before, with present continuous. I hope you find it useful! This is a list of useful strategies/activities/ideas for teaching and supporting EAL students. I gave this out at school to all teachers. It is set to print to A3. 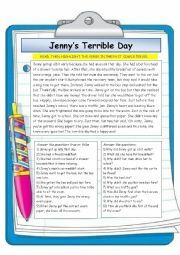 A reading comprehension focusing on the past tense, with activities. I have treated myself to a beautiful template by eslprintables member Baiba. Hope you can use this. Three pages of exercises on the present continuous. Thank you to Ravensburger Puzzles for their permission to use this (wonderfully busy!) picture. I hope you will find it useful. For and against school uniform. I did this because we are changing our uniform at school. 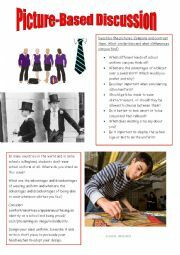 I don´t think school uniform is the norm in other countries, but it might be useful to some of you. Here is a compilation of great warmers/short activities, many of them ´ready to go´. 56 (I think!) slides. Hope you find it useful! Some slides on making resolutions. Personality adjectives and ´I´m going to/I´m going to be´. The ´blackboard´ slides are based on an idea by a member here, for classroom display. As the title says - short stories, with exercises. I have uploaded most of these individually. 21 slides, each with an image or images and exercises. 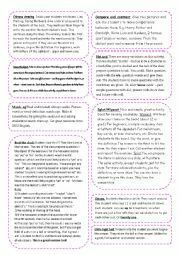 I´ve prepared this for English GCSE students, but a lot of it is useful as an esl resource. Some slides about Europe, its capital cities and languages. A selection of lexical activities. These make great lesson starters. Anti-bullying week is coming up. 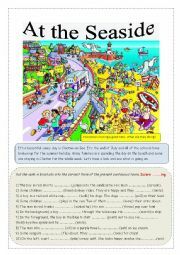 I have made this for native English speakers, but I think a lot of the activities will be useful for esl teachers. Thank you to Tony Wow for permission to use his heart warming story about Kyle. There are some great cliparts on here! I have set the activities/questions to fly in. 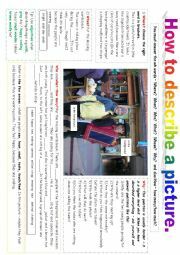 You might want to just show the images first and get the pupils to describe them. Or play ´Splat!´ Two pupils come to the board. Teacher describes an image. The pupil to touch it first is the winner.